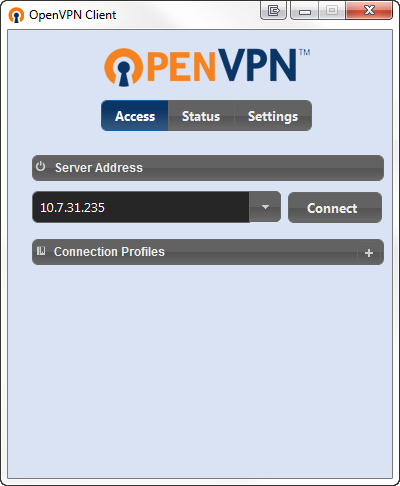 This guide will cover the process of connecting to an OpenVPN Server with the Desktop Client. Launch the Desktop Client and enter in the IP Address of the server you want to connect to in the Server Address Field and click the “Connect" button. 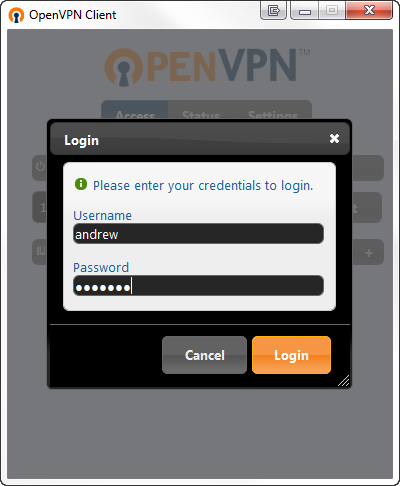 After logging in with your VPN Credentials the connection will begin. *Note: After entering in your VPN Credentials you may be prompted to select a profile to connect with, make sure to choose the desired profile, if you have any questions about this contact your VPN’s Administrator. Depending on how your Administrator has configured your server you may be prompted to accept and Untrusted Security Certificate, if this happens you can choose “This time" to accept it only once or “Always" to accept the certificate and avoid this warning when connecting to this server in the future. After accepting the certificate you will see some status dialogue, the client will start to obtain the configuration and assign you a VPN IP Address. You should now be connected to the VPN Server.